Wednesday was a big day at work! I tried on a few outfit ideas to look as professional as possible. It was the kind of day where if I'd had a suit, I'd have worn it. Ended up settling on a top and pencil skirt combination, I think it looked okay? Much too warm for a blazer, although it was a consideration for a while. A few weeks back I had a massive "I have nothing to wear to dress the bump" freak out, and had the urge to go shopping. Knowing that most of what I would buy would be temporary, I hunted on ebay and put in some low bids. This pencil skirt is one of the items I won. I've heard good things about Soon Maternity, and at $75 new, I got it for a complete bargain second hand. However, it's the wrong size and pretty worn, nothing like the description. I figure for the next couple of months I can put up with it, as it was the only cheap plain black maternity pencil skirt I could find. The seller massively overcharged on postage, so it wouldn't be worth my while returning it. At the very least, it's a good reminder to myself to not get carried away with pregnancy hormones, and be careful what I buy online! Last worn: French connection print top, Marc by Marc Jacobs camel flats, Marc by Marc Jacobs Fran bag. First time I've worn the pencil skirt. Today's outfit was one of my Wednesday rejects! Thought that a plain pencil skirt would have been perceived to be more professional than a printed one. This was absolutely perfect for a normal day in the office. Really liked this outfit, even better than yesterday's. More cheerful with the colour I think. 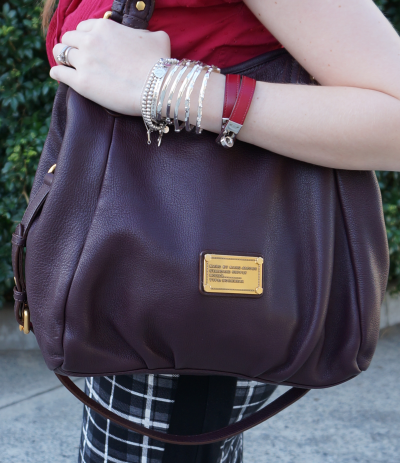 Last worn: Ray Ban wayfarers, red shirt, Asos tartan maternity pencil skirt, Wittner black flats, MbMJ Fran bag (see above). 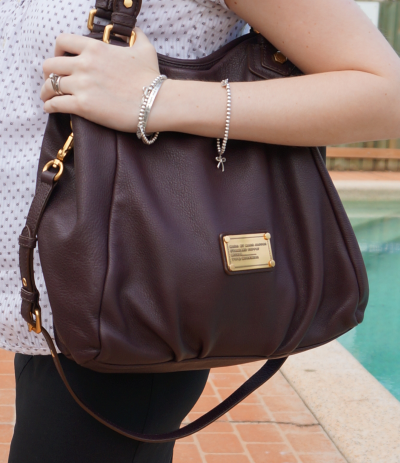 Linking up with Fashion Informant, Three-Fer Thursday, Casual Friday, What I Wore to Work, Fashion Item Friday, Friday's Fab Favourites today. you're glowing! I'm so happy to see your baby bump growing so well. Love that monochrome skirt! Lovely outfits! The baby bump is so adorable! The red outfit..very pretty.. :) Hows the lil one comign along? when is the due date? ?you are sooo glowing mommy-to-be!! I love the print on the second skirt, it really looks great with the red top and the I love the cute little polka dots on the first outfit. You're looking great! oh no! i hate when i buy things online and they're completely different than their description! at least you didn't spend a lot of money and the skirt does look nice in photos. Thanks :) I can put up with it not being the perfect fit for a little longer, won't be long before baby arrives! Just so frustrating, ebay can go so wrong sometimes! 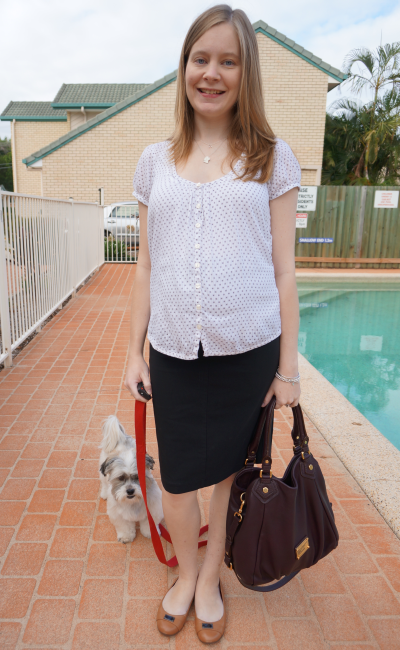 i definitely needed some maternity skirts when i was pregnant! will have to keep Soon Maternity in mind for next time. :) you look beautiful! That black and white check skirt is so cute with red! And why do people say things about your bump getting bigger? I could never figure that out. I think you look amazing! You look lovely in both - and you're wearing that black and white skirt i like. I didn't even think about shopping on eBay for maternity wear. Awesome idea Mica! They're so expensive and you won't be in them long. Saves you money girl. I love that red top on you. Such a pretty color. Haha I say you enjoy all sorts of comments regarding bump! It's a precious time and treasure every moment of it! Hey, chocolate? That baby has good taste! Baby has very good taste! Chocolate, ice cream, cheese....the bump wants it all! I have seen the Big W maternity range, although not purchased anything yet. Although I've tried 2 kmarts and just got lost trying to find the maternity section....next time I'll have to ask someone for help! haha! Cute dog!!! Love the outfit! You look great! Ps. I love the white with dots top the most. It is darling on you! Oh my gosh, first of all, you look gorgeous! You are a hot mama! :) You have such great taste and style, I don't think you could ever go wrong with your choices. I really like the skirt in your second outfit! And I wouldn't have even known that you're pregnant without reading. I think you're rocking those outfits. I have the same bag in black! I love it! i'm so inspired mica, this is amazing pregnancy office style!